Iranian President Ahmadinejad looking at a fuel rod at Iran's research reactor (Image source: The Guardian). One of the most significant and underreported developments in the August 30 report of the International Atomic Energy Agency (IAEA) on Iran's nuclear program was the decrease in Iran's stockpile of 20 percent-enriched uranium. The sparse attention given to the stockpile figures in the mainstream media was surprising given that the six powers negotiating with Iran have assigned such a high priority to halting and reversing the growth in this stockpile. Ship the 20 percent enriched uranium stockpile out of the country. If on the other hand, Iran only had its much larger stockpile of 3.5 percent UF6 to draw on for producing the weapons grade uranium needed for a bomb, it would take half a year. Large stockpiles of 20 percent enriched uranium thus pose a much more rapid "breakout" option for Iran to build nuclear weapons than it would derive from large stockpiles of 3.5 percent enriched uranium. The IAEA confirmed in January that Iran had begun producing 20 percent enriched uranium at the deep underground (and less vulnerable) facility at Fordow. Former IAEA Safeguards Department chief Olli Heinonen noted then that: "At current production rates, Iran can expect to have a stock of 20 percent enriched uranium of around 250 kg by the end of 2012..."
Yet, the IAEA's latest report counted only 91.4 kg in the UF6 stockpile at this level, lower than the 101 kg reported by the agency in May. This decrease is explained by Iran's continuing withdrawal of 20 percent enriched UF6 for conversion into U3O8 in the form of metallic fuel plates for use in the ageing Tehran Research Reactor (TRR), which makes medical isotopes. 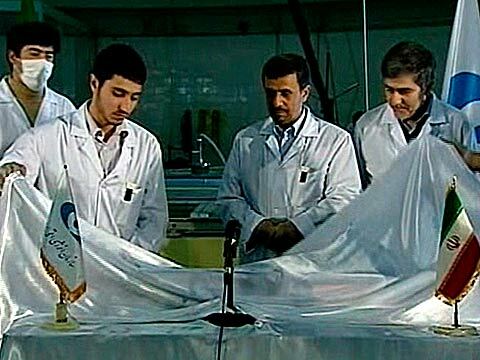 In spite of the growth in the gross amount of 20% enriched uranium produced during the latest quarter, Iran was no closer to being able to achieve sufficient weapons grade uranium for a bomb. Importantly, uranium in the form of fuel plates cannot easily be converted back into the gaseous form required for further enrichment. Even though still enriched to 20 percent, it is essentially no longer available for diversion into a military program. An equally important detail from the IAEA report is the absence of evident progress by Iran on expanding the number of its advanced centrifuges in operation. More advanced centrifuges could enrich much more efficiently than the older IR-1 model now installed at both the underground fuel enrichment facilities at Fordow and Natanz. The more advanced IR-2 and IR-4 centrifuges are still limited to the three cascades that have been in operation for some time at the above-ground Pilot Fuel Enrichment Plant at Natanz. Iran does not appear ready to move quickly to put a useable nuclear arsenal in place. Realistic scenarios for Iran breaking out of the nuclear Non-Proliferation Treaty feature both a sizeable stock of 20 percent enriched uranium and deployment of upgraded centrifuges. Commentators like Mark Fitzpatrick (IISS) and Gareth Porter (IPS) gave prominent billing to these elements of the IAEA report early on; Walter Pincus later highlighted the 20 percent stockpile in an analysis on the inside pages of The Washington Post. However, most media coverage did not, emphasizing instead the 20 percent enriched uranium production increases and the doubling of centrifuge numbers at the Fordow facility. Whether one focuses on the glass half-full or half-empty, it is clear from the latest IAEA statistics that an Iranian nuclear threat is not yet imminent. The incremental increases in Iranian nuclear capabilities and continuing resistance to compromise by negotiators on both sides certainly provide ample grounds for concern. But the absence of bad news on 20 percent stockpiles and advanced centrifuges provide reminders that the window of opportunity for peaceful resolution of the Iran nuclear imbroglio is still open. The year following the U.S. presidential election will be a critical period for using diplomacy to bridge the divide. It is not too soon to start exploring creative options.